On-loan Arsenal striker, Chuba Akpom, who is currently playing for Brighton in the Championships looks to have finally made up his mind to dump England and play for the Super Eagles. 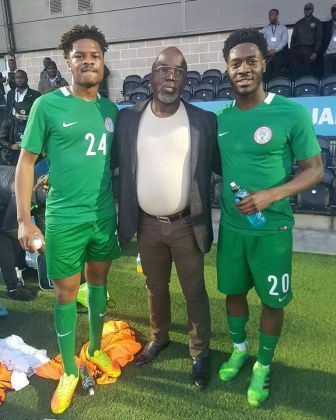 Akpom was pictured in the Super Eagles jersey on Monday alongside Chelsea’s Ola Aina who also seemto have accepted to pledge his future to the Nigeria national team instead of the Three Lions. Both players stared in the test match played by the Super Eagles on Monday and the duo may now get their official debuts when the Eagles will be lining out for another friendly in the next FIFA window. Both Akpom and Aina have played for the England youth teams but they seem ready to toe the path taken by the likes of Alex Iwobi and Victor Moses who despite playing for the junior English teams switched over to Nigeria and they were better for it.